Use the Resource Substitution Wizard only during the planning stages of a project—before you set the project baseline, initiate work on the project, and start entering actual progress information. The Resource Substitution Wizard is not designed for projects in which actuals have been entered. You can use the Resource Substitution Wizard to find a resource or do some planning in a project that includes actuals. Just don't save the project or publish the data, and you'll be safe. If you add a set of tasks after you have begun entering actuals, you can still use the Build Team dialog box to find the right resources for tasks. In your project plan, create generic resources and assign the appropriate RBS code or other custom outline code defined by your organization for identifying resource attributes or qualifications. Assign those resources to the new tasks. Then use the Build Team dialog box to match and replace the generic resources. See "Replacing and Matching Generic Resources" in the previous section on page 665 for details. For more information about using the Resource Substitution Wizard with projects containing actuals, download the online book "Microsoft Office Project Server 2003 Application Configuration Guide." Go to http//www.microsoft.com.downloads, and then search for Project Server 2003. 1 Make sure that Project Professional is connected to the project server. 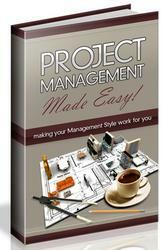 2 In your checked-out enterprise project, click Tools, Substitute Resources. The Welcome page of the Resource Substitution Wizard appears. 3 Read the Welcome page to make sure you have all required components in place. Then click Next. The Choose Projects page appears (see Figure 22-17), listing all the project files currently open on your computer. This page makes it possible to replace substitutes in multiple enterprise projects at one time. Figure 22-17. Use the Choose Projects page to select the projects in which resources should be substituted. 4 Select the check box next to the project in which resources should be substituted. Then click Next. The Choose Resources page appears (see Figure 22-18). Figure 22-18. Specify the categories of resources that should be substituted in the Choose Resources page. 5 Select the option representing the categories of resources you want substituted. If you click the In The Selected Projects option, the wizard will try to find substitutions for all resources in the projects selected in the previous Choose Projects page. This option is selected by default. 6 Select the Allow Resources With The Proposed Booking Type To Be Assigned To Tasks J: check box if you want resources defined with the proposed booking type in the enterprise resource pool to be suggested as a substitute in your selected project. 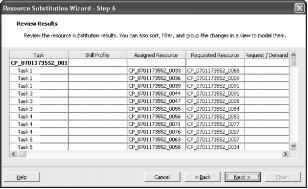 7 In the Resource Freeze Horizon box, select the date that represents the earliest start date for tasks being staffed by the Resource Substitution Wizard. This means that any tasks starting before this date will not be considered for resource substitution. By default, the Resource Freeze Horizon is today's date. The Choose Related Projects page appears. This page lists any other project files that have some relationship with the selected projects, such as cross-project links or a non-enterprise resource pool. Select the check box next to any related project that you want to be included in the resource substitution process and then click Next. The Choose Scheduling Options page appears, listing all projects and related projects you have selected for substitution to this point. If you want one project to have a higher precedence in the resources that are substituted, increase its Priority value to be higher than the others. Projects with higher priority values have their resources substituted first, and therefore tend to get the better resource matches than projects with lower priority values. Priority values range from 1 to 1000, with 500 being the default. 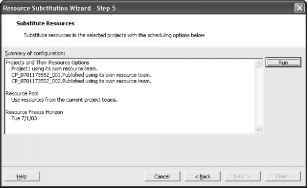 In the Options column, specify whether the resources to be used for substitution are to come from the project itself or from the entire enterprise resource pool. This option is key to getting a resource substitution with your intended results. Click Next. The Substitute Resources page appears (see Figure 22-19). Figure 22-19. Review your resource substitution setup and then click Run. 13 Review the configuration summary, which is based on the selections you have specified so far. If you want to change one of the specifications, click Back to find the page you need and make the necessary changes. If everything looks right to you, click the Run button to initiate the resource substitution process. When the process has completed, the Review Results page appears (see Figure 22-20). 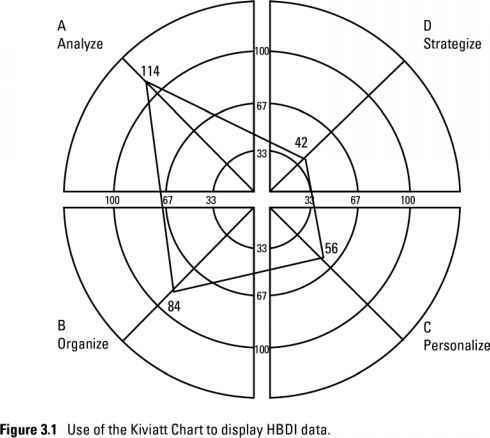 Figure 22-20. Review the resources that have been found. 14 Review the fields for all the tasks in your selected projects. Each task in each selected project is listed, along with the task's associated skill profile, the currently assigned resource, and the potential substituting resource. Note that no changes have actually been made to your project(s); this is just a model of potential changes. Note If you're dissatisfied with the results of the resource substitution and want to change the parameters, click Back to find the page you need and make the necessary changes. Then run the substitution process again. 15 In the Review Results page, click Next. The Choose Update Options page appears. 16 Specify how you want to proceed with the substitution results. If you want to change the selected projects with the substitution results, select the Update Projects With Result Of The Wizard check box. This is the default. If you want to save the results for reference or modeling as a report, rather than changing your project just yet, select the Save Results Of The Wizard check box. Then click the Browse button to find and select the folder where you want to save the results report. 17 Click the Next button. The Finish page appears, and the progress bar indicates that your projects are being updated or the results report is being created. 18 Read the suggestions on the Finish page and then click Finish. 19 Review the changes in your projects. If you would rather discard the changes, close the project without saving. If you're happy with the changes, save the project to the project server as usual.